Shhhh, I have a guilty secret! I love to lick the batter off the spatula! Especially when making chocolate cake. When I first started baking as a child, I thought cakes came out of boxes. We would get a box cake mix, add oil and eggs and whisk it all up. The batter would then be placed into baking tins and bake in the oven while my sister and I each got a whisk to lick off. Well, that was an invaluable experience for me. After many years of not eating sugar, I felt like chocolate cake. I had no idea where to start in baking one but I knew that cake batter made from scratch had to have sugar, cake flour and butter. I devised what I thought was an original cake recipe, by adding equal weight measures of fructose, flour and butter together. I now know that this equal measure cake is called a pound cake due to the original recipe having a pound of each of the main ingredients. For my first attempt at the recipe, I did not cream the butter or sieve the flour, but I knew I had to add baking powder to make sure it would rise. As I mixed the ingredients together I added the eggs I would have added to a box mix, and looked at the consistency of the batter. What I was aiming for was the taste and texture I could remember from my childhood. This led to me adding some milk and lo and behold, I had a batter that reminded me of baking with my sister. This has become my ‘go to’ recipe for when I need a cake in a hurry. When I made my ‘go to’ recipe using a cup for cup equivalent so that I could use the Canderel Yellow 0%, it did not come out the way I wanted. It was tasty and dense and very chocolaty. But, I wanted something light and moist. This might have had everything to do with my ‘winging’ it, as opposed to applying the chemistry of baking to what I was doing. I was not going to go down defeated. And so, I tried again! 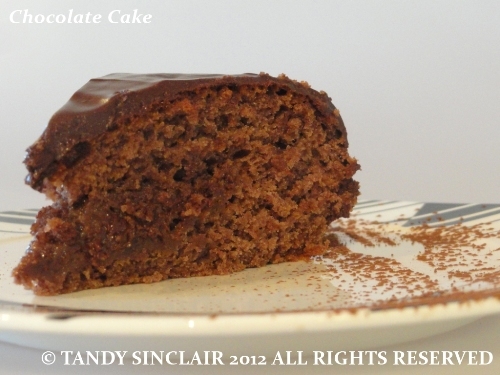 I made some slight adjustments to the recipe and what I am sharing with you today is a divine, moist, almost caramel flavoured chocolate cake. And yes, I still lick the whisk! Is there something you do when baking that is a secret? Shhhh, I have a guilty secret! I love to lick the batter off the spatula! Disclosure: This post was commissioned and paid for in conjunction with the Canderel Yellow “What’s Your Guilty Food Secret?” Competition. This post is in line with my blogging policy. It’s the best part about baking…licking the bowl and spoon!! without a doubt 🙂 thanks for the visit! Spatulas were invited the ensure we get every single bit out of the bowl and onto our tongues 🙂 I do it too, and in Singapore, the only cake mixes came out of boxes too! No cake baking extravaganza is complete without some spatula licking! This cake looks delicious! I think you are in good company. If we are a foodie, how could we not enjoy every last bit of something delicious. Good that you worked out the recipe. It looks nice and moist just like you wanted. Another one of your recipes I will have to make, thanks Tandy. Lovely cake, Tandy!! I never lick the left over batter, but my children do!! Have a lovely weekend! See you on Sunday! I alway lick the spatula & lick the leftover batter in the kenwood bowl before washing it! Your cake looks just stuning, my friend! 🙂 Yummm! Great recipe and I think licking the spatula is the chef´s perogative (is that how you spell it?!)! I’ve never seen Yellow Canderel here in the UK. We have the red package sort, and I don’t know what the diff is. It’s all a bit confusing. Tandy, you have a lot of guilty secrets! And I don’t think you need to feel guilty about any of them! 🙂 Lovely cake recipe..and it looks moist and delicious too!